NEXT at the Corcoran exhibits the work of students graduating from both the graduate and undergraduate programs at the Corcoran College of Art and Design. Corcoran Gallery of Art. April 24 – May 19 2013. The Corcoran Association of Photojournalists hosted reCAP, a one-night-only exhibition featuring short films and stills at the Corcoran Gallery of Art. April 24 2013. During Foto Week second year students in the New Media Photojournalism program at the Corcoran College of Art and Design displayed video and stills in the exhibition This is Not a Photo in Gallery 31. November 7 – November 18 2012. For one night only in the North Atrium of the Corcoran Gallery of Art, the Corcoran Association of Photojournalists hosted Convergence, their first show at the Gallery and their second exhibition since CAP was founded in the fall of 2011. August 30 2012. 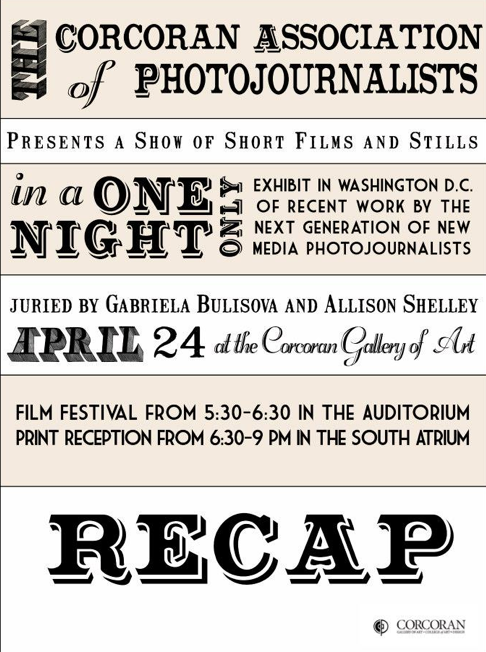 The Corcoran Association of Photojournalists, founded by the inaugural class of New Media Photojournalism graduate students at the Corcoran College of Art and Design, exhibited CAP Collective, at THEARC in Southeast DC. May 5 – June 8 2011. In conjunction with Holly Hughes’ “The Dog and Pony Show,” Standing Heat explores relationships between companion animals and humans. Small 2D works from an international call for entries respond to Gertrude Stein’s assertion: “I am I because my little dog knows me.” November 13 – December 5 2010.